I am having a few issues setting up my multi wii controller I made for my Quad. and i cant seem to get my readings to be stable. I am new to the dx8 and am wondering if i am doing something wrong. I have setup the travel to 105% as stated and then using the sub trim menu setup each middle ground. this is ok 1 or 2 points off. i then try and go back to the max and min trying to set 1095 and 1905 but this then blows out the middle setting. What ever i try it seems to not be very stable. I do have the nunchuck on this also and wondered if i should remove it and see if this helps? at a bit of a loss as you all can tell. can anyone advise me on the best way forward. no one got anything to say on this? surely i am not a pioneer in this field ??? Most of us are very into KK Boards because they are much simpler to use then Multi Wii. Most of us don´t know much about it. I will hopefully mount a Multi Wii Board with barometer and GPS in half a years time. Any one gt good tips on setting up a hk kk board with dx8 then? Do you have any info you can share on settings etc. where to start. What i am doing wrong? not sure if its the NK that is causing me the issues or not or even my transmitter. Then I have a 2way lever for lights. Thanks man this would be great. You have hit on one thing straight away I only set travel to 105 as stated in some doc I found so 125 would make sense. how do you achieve the 1095 / 1500 / 1905 values on a Spectrum Radio? as it seems what ever i try it sets the values off? Any chance you can post a screen shot fo the settings on your and what you changed to trim what? I looked at my radio programming yesterday and it is totally clean except 125% travel on each channel. Always calibrate on a level surface (I glued a Button spirit level to the frame. i will give it a go. One small thing how do you download the files from the goggle code repo. Every time i try it says file is corrupt? any ideas. Some of the commands are sensitive to which one of your sticks you move 1st. 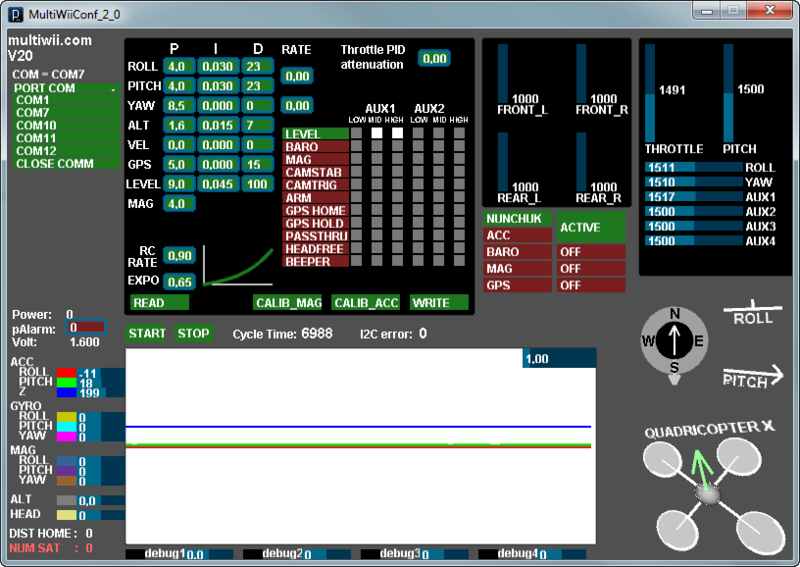 I'm going to swap my AR6100 on a Tricopter to FRSKY D8R-II so I will connect to GUI 1st to take a few screenshots for you.